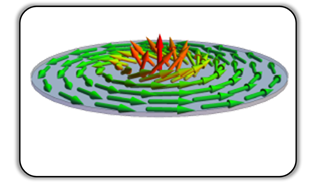 The magnetic vortex is a topological singularity stabilized in thin ferromagnetic platelets due to the competition between demagnetizing and exchange energies. One of the main originalities of our work is the use of magnetic resonance force microscopy, MRFM, to detect the magnetization dynamics in individual soft magnetic dots with high dynamical quality. Extensive work has been performed on these systems in the cone state, where the vortex is deformed by a magnetic field applied perpendicularly to the sample plane. In particular, the latter lifts the frequency degeneracy of the gyrotropic modes associated to opposite core polarities p = ±1, which allows a simple spectroscopic determination of the core orientation with respect to the bias field , and enables deterministic dynamical reversal of the vortex core . Taking advantage of the strayfield of the MRFM probe, the anharmonicity of the magnetostatic confinement potential of the vortex core can be determined . This work on vortex dynamics has strong connections with our research activities on vortex-based spin torque oscillators, where applying a perpendicular field and determining nonlinearities are crucial. It is also relevant for studying, magnetic skyrmions, which are other non-trivial topological textures appearing in materials with strong Dzyaloshinskii-Moriya interaction, which favors chiral configurations of the magnetization. B. Taurel, T. Valet, V. V. Naletov, N. Vukadinovic, G. de Loubens, O. Klein, Complete mapping of the spin-wave spectrum in a vortex-state nanodisk, Phys. Rev. B 93, 184427 (2016). B. Pigeau, G. de Loubens, O. Klein, A. Riegler, F. Lochner, G. Schmidt, L.W. Molenkamp, Optimal control of vortex-core polarity by resonant microwave pulses, Nature Phys., 7, 26–31 (2011). O. V. Sukhostavets, B. Pigeau, S. Sangiao, G. de Loubens, V. V. Naletov, O. Klein, K. Mitsuzuka, S. Andrieu, F. Montaigne, K. Y. Guslienko, Probing the Anharmonicity of the Potential Well for a Magnetic Vortex Core in a Nanodot, Phys. Rev. Lett. 111, 247601 (2013). Spin torque nano-oscillators (STNOs) are spintronic devices capable of generating a tunable oscillation voltage in the microwave range when biased by a dc current. They are based on two reciprocal physical phenomena, the spin transfer and magnetoresistive effects. A striking feature of such devices compared to other oscillators is their strong nonlinear properties, intrinsic to magnetization dynamics. This yields very interesting and attractive properties for applications including highly tunable frequency emission. Indeed, STNOs can easily adapt their auto-oscillation frequency to phase-lock to an external signal, or synchronize to other oscillators. Yet, their sensitivity to noise is exacerbated by the nonlinear phase-amplitude coupling. Thorough spectroscopy of these heterostructures is crucial to understand and improve their characteristics. Using MRFM, we identified the spin-wave eigenmodes and their selection rules in a STNO  and the first spin-wave mode to auto-oscillate in the autonomous regime, while driven by spin transfer torque . Using high frequency transport techniques, vortex-based STNOs can also be studied. When each magnetic layer is in the vortex state, a highly coherent auto-oscillating mode has been evidenced as well as the influence of damped spin-wave modes on its spectral purity. Moreover, synchronization processes in these STNOs, such as perfect phase-locking to a weak external microwave field and mutual synchronization in a pair of oscillators, can be observed . V. V. Naletov, G. de Loubens, G. Albuquerque, S. Borlenghi, V. Cros, G. Faini, J. Grollier, H. Hurdequint, N. Locatelli, B. Pigeau, A. N. Slavin, V. S. Tiberkevich, C. Ulysse, T. Valet, and O. Klein, Identification and selection rules of the spin-wave eigenmodes in a normally magnetized nanopillar, Phys. Rev. B 84, 224423 (2011). A. Hamadeh, G. de Loubens, V. V. Naletov, J. Grollier, C. Ulysse, V. Cros, O. Klein, Autonomous and forced dynamics in a spin-transfer nano-oscillator: Quantitative magnetic-resonance force microscopy, Phys. Rev. B 85, 140408(R) (2012). N. Locatelli, A. Hamadeh, F. Abreu Araujo, A. D. Belanovsky, P. N. Skirdkov, R. Lebrun, V. V. Naletov, K. A. Zvezdin, M. Muñoz, J. Grollier, O. Klein, V. Cros, G. de Loubens, Efficient Synchronization of Dipolarly Coupled Vortex-Based Spin Transfer Nano-Oscillators, Sci. Rep. 5, 17039 (2015). Recent developments in spintronics aim at getting rid of sources of dissipation by manipulating pure spin currents without their charge counterpart. One convenient way of achieving pure spincurrent generation consists in using the spin-orbit coupling interaction via the spin Hall effect in a non magnetic heavy metal like Pt. It has been shown that these pure spin currents could induce magnetization dynamics by generating spin-orbit torques. In our group, a substantial effort is focused on hybrid structures based on YIG, the magnetic insulator with the lowest dynamic damping. Using MRFM, a direct evidence that the ferromagnetic resonance linewidth in a YIG/Pt micro-disk varies with the dc current injected in the Pt layer is provided . The complete compensation of damping, leading to auto-oscillation, can only be achieved in YIG/Pt microstructures. Indeed, the key points to observe such a behavior are both to reduce the thickness of the YIG layer by keeping its high dynamical quality in order to lower the threshold current, and to laterally confine the system to a few microns in order to limit the mode competition. This is confirmed by the direct electrical detection of auto-oscillations in samples of micron sized diameters . These results imply that careful engineering of the spin-wave mode spectrum is required to optimize magnonic devices making use of spin-orbit effects. Besides spin Hall effects in YIG/Pt bilayers, another spin-to-charge conversion called inverse Rashba-Edelstein effect is also being studied. It stems from the spin/charge properties of Rashba split interfaces states as can be found in Bi/Ag  and LaAlO3 /SrTiO3 bilayers. A. Hamadeh, O. d’Allivy Kelly, C. Hahn, H. Meley, R. Bernard, A. H. Molpeceres, V. V. Naletov, M. Viret, A. Anane, V. Cros, S. O. Demokritov, J. L. Prieto, M. Muñoz, G. de Loubens, O. Klein, Full Control of the Spin-Wave Damping in a Magnetic Insulator Using Spin-Orbit Torque, Phys. Rev. Lett. 113, 197203 (2014). M. Collet, X. de Milly, O. d’Allivy Kelly, V.V. Naletov, R. Bernard, P. Bortolotti, J. Ben Youssef, V.E. Demidov, S.O. Demokritov, J.L. 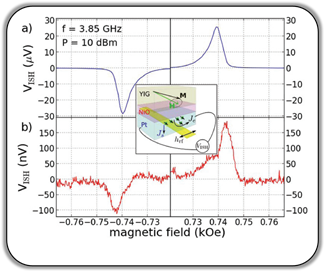 Prieto, M. Muñoz, V. Cros, A. Anane, G. de Loubens, O. Klein, Generation of coherent spin-wave modes in yttrium iron garnet microdiscs by spin-orbit torque, Nature Commun. 7, 10377 (2016). S. Sangiao, J. M. De Teresa, L. Morellon, I. Lucas, M. C. Martinez-Velarte, and M. Viret, Control of the spin to charge conversion using the inverse Rashba-Edelstein effect, Appl. Phys. Lett. 106, 172403 (2015). Antiferromagnets (AF) have several key potential advantages compared to ferromagnets including insensitivity to external perturbations like electromagnetic fields, reduced mutual interaction with their neighbouring domains as well as ultrafast capabilities in the terahertz range. 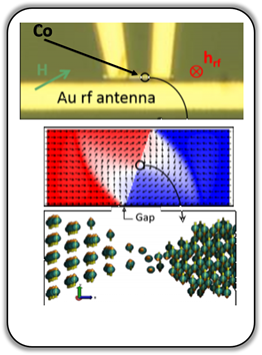 For these reasons, AF are currently envisioned as a promising playground for future ultrafast spintronics devices. However, because of their it is very hard to control the antiferromagnetic order. In the last years, we have worked on the two fronts of spin conduction in insulators and antiferromagnetic imaging. The former started a few years ago with our first demonstration that insulating antiferromagnets are spin conductors . This is an important conceptual discovery as we realized that a spin current can flow without conduction electrons. We proposed that the conducting entities are spin excitations in the form of intrinsically spin charged antiferromagnetic waves, or antiferromagnons. On the other hand, it has now become essential to visualize the AF domains and domain walls. For this reason, we have developped a non-linear optical microscope based on second harmonic generation (SHG) which can uniquely access the AF order . 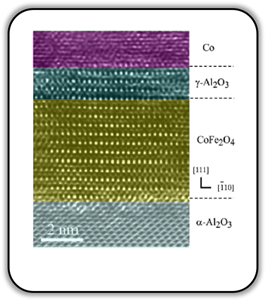 We have also chosen to study insulating antiferromagnets because of their superior dynamical properties and high quality AF oxides are epitaxially grown in the LNO using PLD and MBE in the LNO. C. Hahn, G. de Loubens, V. V. Naletov, J. Ben Youssef, O. Klein and M. Viret, Conduction of spin currents through insulating antiferromagnetic oxides, Europhys. Lett. 108, 57005 (2014). J.-Y. Chauleau, E. Haltz, C. Carrétéro, S. Fusil and M. Viret, Multi-stimuli manipulation of antiferromagnetic domains assessed by second harmonic imaging, Nature Materials 16, 803 (2017). Magnetization dynamics at ultrashort timescales has been triggered by the pioneering work of Beaurepaire et al. (PRL 1996) and is now a very active field of research in the magnetism community. We have recently developed a time-resolved magnetooptical setup allowing the study of ultrafast magnetic phenomena. In particularly, we currently focus our work two fronts including on the generation of picosecond hot electron spincurrents and their effiecient conversion into terahertz pulses in ferromagnetic/heavy metal bilayers, as well as time-resolved SHG imaging by pump-probe techniques. The use of organic semiconductors in spintronics, or organic spintronics, is a new and promising research field. Because organic semiconductors (polymers, small molecules) have a weaker spin-orbit interaction than inorganic semiconductors, spin coherence lengths can be long, which makes promising the spin injection/detection in these materials. In this framework, we studied the spin injection via ferromagnetic electrodes and transport through organic materials in the form of thin layers, small molecules or even a single molecule. In order to achieve this, different original devices were investigated such as systems based on break junctions or oxide-based magnetic tunnel junctions composed of two ferromagnetic electrodes separated by an organic thin layer . 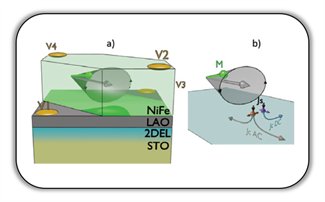 The magnetic behavior and control of the magnetic of complete hybrid heterostructures can be complex. Therefore, one of our research topic ains at using functional molecules for controlling and tuning the magnetic switching in organic-inorganic spintronic devices . C. Blouzon, F. Ott, L. Tortech, D. Fichou, J.-B. Moussy, Antiferromagnetic coupling in hybrid magnetic tunnel junctions mediated by monomolecular layers of alpha-sexithiophene, Appl. Phys. Lett. 103, 042417 (2013). V. Campbell et al., Engineering the magnetic coupling and anisotropy at the molecule-magnetic surface interface in molecular spintronic devices Nat. Comm. 7 13646, (2016). J.-B. 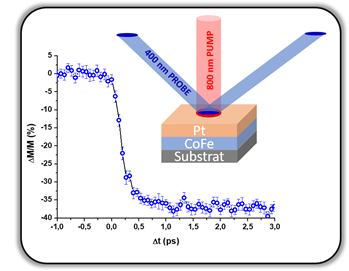 Moussy, From epitaxial growth of ferrite thin films to spin-polarized tunnelling J. Phys. D: Appl. Phys. 46, 143001 (2013). A. V. Ramos, T. S. Santos, G. X. Miao, M.-J. Guittet, J.-B. 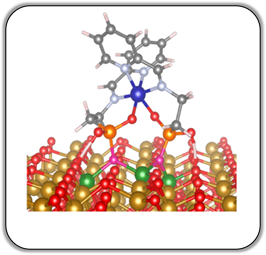 Moussy, and J. S. Moodera, Influence of oxidation on the spin-filtering properties of CoFe2O4 and the resultant spin polarization Phys. Rev. B 78, 180402(R) (2008). S. Matzen et al., Structure, magnetic ordering, and spin filtering efficiency of NiFe2O4 (111) ultrathin films, Appl. Phys. Lett. 104, 182404 (2014). In the last few years, we have studied the interaction between magnetisation dynamics and electrical transport in magnetic nanostructures and atomic contacts. 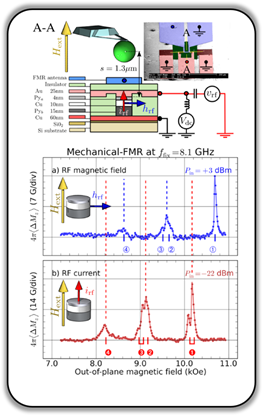 We have achieved atomic sized resolution in the detection of ferromagnetic resonance using a novel experimental setup in which a mechanical break junction experiment is set up in a radio-frequency compatible environment where electrical measurements can be carried out under variable static and dynamical magnetic fields. The resonance properties of magnetic nanostructures were first measured in order to determine the reliability and the high sensitivity of our system. Then the susceptibility of domain walls in nanostuctures at frequencies higher than those classically used for their motion, was measured and found to be large and almost independent of the frequency . This susceptibility was roughly 10 times that obtained in saturated domains. The experimental setup also allowed the study of the interaction between spin currents and the magnetization dynamics of nanostructures at the ferromagnetic resonance. The spin currents dynamically generated at the FMR have been measured in Py/Pt nanostructures using the inverse spin Hall effect in platinum . The influence on the FMR of spin current injection using the spin Hall effect in Pt has also been observed. The FMR of atomic contacts has also been studied. While breaking our nanostructures of cobalt and permalloy, new resonant modes have been shown to appear at fields higher than that of the uniform resonance. These are attributed to the effect of demagnetization fields that are locally modified when reducing the constriction diameter. In the atomic contact regime, we have measured the constrained domain wall resonance. In that case the rectified signal, generated by a few atoms, can reach values 1000 times larger than those generated by the FMR of saturated domains. O Rousseau, S Petit-Watelot and M Viret, Large RF susceptibility of transverse domain walls, J. Phys. : Condens. Matter 24, 024211 (2012).